Facing the wrath of Mumbai’s traffic police, Ishaan Khatter recently faced flak for breaking traffic rules. In an unfavourable incident, the star was held up for leaving his bike in a no-parking zone, before heading off to a restaurant. On returning, Bollywood’s latest chocolaty boy saw his orange and black coloured bike being towed away from where he had parked it outside a Mumbai restaurant. The paparazzi present at the venue recorded the incident and later set the Internet ablaze with the viral pictures and video. However, after paying a fine of Rs 500 reportedly, the 23-year-old actor got his bike back. 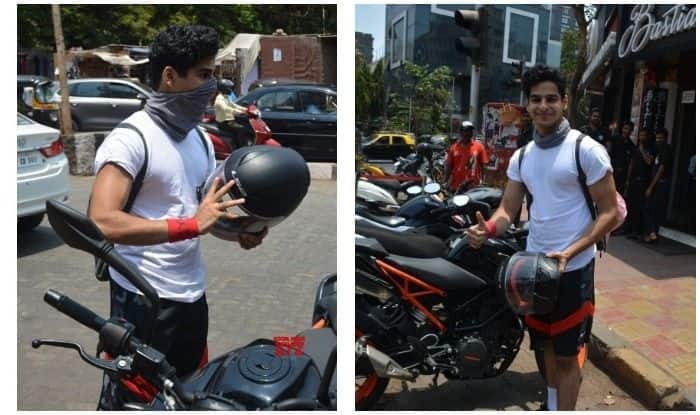 Earlier, the Dhadak actor was trolled for not wearing a helmet while riding a bike. Reacting to the trolls, he took to his Twitter to write, “Thanks for looking out. It was a phone call, yes. Also, not very safe for your photographers to chase and click pictures while on a motorbike”. On the professional front, Ishaan Khatter who made his debut with Majid Majidi’s Beyond The Cloud has been reportedly offered to play the role of freedom fighter Birsa Munda in his biopic. According to a report in DNA, Ishaan was recently offered the role of Munda for the biopic. Ishaan’s performance in his debut film Beyond The Clouds was applauded by many. Fans are now eagerly waiting to see the actor ace it on the silver screen once again with his astounding performance.